“If you like greenwashing clap your hands”, sang dozens of activists on the opening day of Solutions COP21, the hotspot for industry presenting false solutions for climate change, at the prestigious Grand Palais in Paris. Today, we were clapping our hands once more, at an event promoting ‘Climate Smart Agriculture’ (CSA) inside this summit of greenwash. 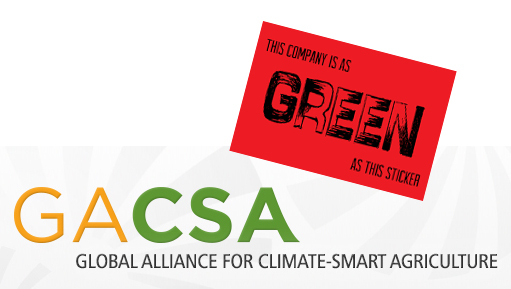 Internationally, it is the Global Alliance for Climate Smart Agriculture (GACSA) most promoting the CSA concept (read more about CSA in the Corporate Cookbook published by Corporate Europe Observatory). GACSA is heavily criticised by NGOs and movements. In a statement for COP21 these organisations note how agribusiness corporations that promote very climate-unfriendly practices have already boarded the Climate Smart train – because it does not demand any real change. As pointed out in this GRAIN report, the GACSA leadership is stacked with fertiliser companies, dubbed “The Exxons of Agriculture”. There was one important difference to other CSA events seen so far: this one focused on ‘climate smart’ solutions in Europe. Does that mean it was about importing less animal feed (soy, maize) from North and South America, and bringing a halt to the growing polluting exports of dairy and meat products from Europe, and promoting short, local food chains? As you can guess, no, it was not. Just having a look at the list of speakers – Dutch animal feed corporation ForFarmers (“the total feed business”), the Dutch dairy giant FrieslandCampina, the Dutch Ministry of Economic Affairs and the original dirty business spindoctors, the World Business Council for Sustainable Development (WBCSD) – you know you’re up for a troublesome event. But in the eyes of the organisors, it was all flagships, boosters and win-win-win. The event was organised by ‘CSA Booster’ and ‘Climate KIC’. CSA Booster, according to its website, is a network of enterprises and organisations, with the goal to “increase the development, marketing and adoption of CSA solutions in Europe”. “At this moment CSA Booster has a portfolio of 50 CSA solutions of which 25 are ready to go to market.” Climate KIC is “the largest Public Private Partnership in climate change”, according to its former director speaking at the event, and is co-funded by the EU. Private partners include Bayer (dirty pesticides) and ENGIE (dirty energy). Jean-François Soussana (Scientific Director Environment at French agricultural research institute INRA) gave an opening speech to set the economic, environmental and political context of Climate Smart Agriculture. The message was clear: agriculture now contributes 24% to global greenhouse gas emissions, and by 2050 will be the largest emitter. Agriculture is not covered by any climate agreement, however 92 countries have included ‘AFOLU’ (jargon for Agriculture, Forestry and Land Use) in their INDCs (jargon for Intended Nationally Determined Contributions, or non-binding national climate pledges), and make these sectors responsible for around 25% of their intended emissions reductions. Soussana highlighted the role of soil in carbon sequestration, in line with the French flagship project ‘4/1000’, a voluntary action plan focusing on increasing soil carbon stock as a way to improve soil fertility and limiting temperature increase to +1.5-2°C. (Perhaps worth remembering, the EU directive to protect soils was one of the prime victims of the war on ‘red tape’ called ‘Better Regulation’). However, most of the following ‘pitches’ for Climate Smart Agriculture had very little to do with either greenhouse gas emission reductions or with improving our soils. First, a great example of a CSA way to adapt: because of climate change, grape harvest now starts in mid-August instead of September, but temperatures are too hot and oxidation will affect the taste. Solution: pour liquid CO2 at -30 degrees Celsius over the grapes to cool them. Uhhh… great for wine lovers, but climate smart!? Second, Jaap Petraeus of dairy giant FrieslandCampina legitimised its company exporting dairy products all over the world by pointing out the importance in the diet of billions of people (who of course all depend on Dutch dairy), and the importance of dairy production for farmers’ income (only last month the company stopped taking the milk of 443 dairy farmers in Belgium causing huge outcry). So where is FrieslandCampina’s smart emissions reduction? What a bummer, there isn’t any. Even worse: with the EU’s milk quota being abolished, FrieslandCampina’s farmers will increase their production by an expected 20%. This increase, Petraeus said, will be offset in terms of emissions by on-farm measures like manure digesters and increased lifespan of cows. This however ignores the increased imports of animal feed for the livestock sector from the Americas that will be required, and that are not counted towards the Dutch emissions. This causes additional environmental and social havoc including deforestation and landgrabbing in countries like Argentina and Paraguay. The animal feed corporation ForFarmers also foresaw a growth in demand for animal protein, and mentioned ‘responsible sourcing of raw materials’ as one of the solutions. For instance, FrieslandCampina is a member of the Round Table on Responsible Soy (RTRS), a meaningless voluntary labelling scheme set up by WWF with big firms like Monsanto and Cargill, that doesn’t do anything to stop deforestation or reduced pesticide use – but provides a dose of greenwash. The Dutch government loves projects like the RTRS, a figleaf to hide national economic interests behind, and funds it with development aid money. Elmar Theune of the Ministry of Economic Affairs, talked utter nonsense about how in the Netherlands “we have been doing smart agriculture for over 50 years”. Smart in making profits yes, but climate smart cheap pork and all-year-round tomatoes? Didn’t think so. Thirdly, Edie Sonne Hall of Weyerhaeuser, a tree monoculture giant with 8 million hectares of tree deserts in the US and Uruguay, represented the World Business Council for Sustainable Development (WBCSD). The WBCSD has 200 member companies, including Shell, Duke Energy, E.ON, BP and Rio Tinto. The WBCSD pioneered re-branding corporations as part of the solution as far back as the Earth Summit in Rio de Janeiro in 1992. They have the ambition, Sonne Hall said, to “restore forest cover to 1950 levels”. However, a tree plantation is not a forest, and is, in terms of environmental impact, comparable to any other monoculture. Weyerhaeuser is a member of the US wood pellet lobby group USIPA, in Brussels represented by hired gun lobby firm Edelman (along with the EU and Canadian wood pellet lobbies) who set up the ‘Building with Biomass Coalition’. Edelman has made a pledge to no longer work for clients involved in the coal industry. However, biomass (wood pellets) are often co-fired with coal, allowing coal fired power plants to stay open longer. Burning wood biomass is actually far from CO2-neutral, but EU countries fill a large share of their renewable energy targets with biomass as an easy solution. Read more about European PR firms greenwashing for Big Polluters here. And indeed, here the idea of ‘negative’ emissions from burning biomass and then storing the emissions underground, came up. The ultimate excuse for Shell et al to keep sucking oil out of the ground. More about that in CEO’s Lobby Planet to Paris. At an earlier GACSA event in official COP21 conference centre Le Bourget, the organisers tried ‘Borging’ (assimilating) Global Justice Now’s Kevin Smith after asking a critical question. But here at Solutions COP21, there was no such luxury of being critical. The flagships, boosters and win-win-win did not welcome any questions, and definitely no statements.